If you’re looking to care for your cigars until the next celebration or waiting to gift a couple for a friend, you’ll definitely need a humidor. Humidors are designed to maintain the ideal humidity for storing your cigars to imitate the climate where the tobacco originates from. Without a humidor (or if you buy a cheap one), your cigars will most likely only last a couple weeks depending on the climate. No one wants to come back to molded or really bitter cigars, which is why it’s important to get a quality humidor to keep your cigars at optimum taste levels. Below, we go over what to look for in a humidor and review some products in detail to help you decide which is the best cigar humidor for you. The most passionate cigar enthusiasts love admiring their collection and showing it to their friends. However, often, they have to resist the temptation of taking the cigars out of the humidor as doing this too often could damage them. With this in mind, this elegant and stylish humidor doubles as a display for your cigars. Using a tempered glass top, it allows the cigars in your top compartment to be seen at all times. Meanwhile, there are three other compartments where you can store the bulk of your cigar collection. Despite being very reasonably sized, this humidor can hold up to 100 cigars at a time. This makes it the ideal humidor for cigar enthusiasts who have medium to large collections. This is particularly true when the collection is comprised of various different brands and types of cigars. With practicality and convenience in mind, the Mantello 100 Cigar Desktop Humidor Glasstop features a removable Spanish cedar tray. To provide ventilation and facilitate the movement of humid air inside the humidor, this tray has grooves and holes. Additionally, it features a small divider that allows you to further separate your cigars according to characteristics such as brands, types, tastes and countries of origin. In order to absorb excess moisture, the Mantello 100 Cigar Desktop Humidor Glasstop features a Spanish cedar lining that is also perfect for maintaining the temperature at stable levels. As if that was not good enough, this material prevents the growth of tobacco beetles and other pests that may be detrimental for your cigar collection. In addition to the Spanish cedar lining, this humidor is made with high-quality materials. For example, its well-constructed hinges are made with the purest brass, ensuring durability and efficiency despite the amount of use and external conditions the humidor is subjected to. Its internal bottom part is luxurious and soft due to its felt-lined bottom. When it comes to looks, the Mantello 100 Cigar Desktop Humidor Glasstop is at the top of its game. Its design is straightforward and elegant without seeming to simplistic, therefore avoiding the classic complaint that a humidor looks like “just a box”. With a cherry tone that perfectly plays off the colors of cigars, its beautiful high-gloss finish is eye-catching without coming off as tacky. This humidor also features a space where you can securely place a hygrometer, making it easy and quick to check out the interior humidity of the storage unit. Speaking about hygrometers, with full disclosure in mind, it needs to be said that the one that comes with this humidor is not particularly accurate. However, it can easily be replaced with a digital one. Another aspect of this humidor that does not satisfy expectations is that it does not feature a built-in humidifier, elevating to two the number of add-ons you will likely have to buy for it. At any rate, however, both the digital hygrometer and the humidifier are relatively inexpensive items that most cigar enthusiasts are likely to own anyway. Even though it lacks a couple of features that would make it more complete, the Mantello 100 Cigar Desktop Humidor Glasstop stands out among competing products due to its overall high-quality, top-notch construction and beautiful design. In addition, its ability to hold up to 100 cigars make it a perfect device for the most serious cigar enthusiasts and collectors. Finally, its ability to also function as a display for your collection makes it the perfect humidor for displaying your cigars in a cigar room. Four different compartments and a divider help organize your collection. Durable and efficient brass hinges. Does not include a built-in humidifier. Featuring a classic design and a sturdy construction, the Deauville 100 Cigar Humidor is a reliable, efficient and elegant device that will undoubtedly help maintain your cigar collection fresh and delicious for extended periods of time. In addition to its high-quality construction and efficient design, this humidor box stands out due to its incredible capacity. Being able to hold between 100 and 150 cigars at a single time, it is likely one of the humidors with the most capacity on the market. More Space For Nice Humidor! Despite holding as many cigars as it does, however, this product still has enough space to place a hygrometer, a removable tray and two dividers that can help organize your collection according to characteristics such as brand, type or nationality of origin. In terms of material quality, the Deauville 100 Cigar Humidor is up there with the best humidors on the market. It is lined with Spanish cedar, a material that is ideal for maintaining humidity and temperature levels at optimal levels. To improve protection and increase durability, this Spanish cedar lining is dried with a premium kiln. Externally, the Deauville 100 Cigar Humidor features a maple wood finish that gives it a nice, solid feel and a healthy amount of weightM. Helping take its looks to the next level of elegance, the lid features a tobacco leaf inlay that is as beautiful as it is simple. This humidor’s compact, tightly-sealed design is helped by the hidden quadrant hinges it uses to open and close its lid. By remaining hidden from the sight, these hinges are able to perform their function without detracting from the overall look. With security in mind, this humidor features an antique-looking lock with a beautiful key with tassel. Gold-plated and beautifully designed, this lock and key combination gives the humidor a touch of elegance that truly completes its look. As if that was not enough, the Deauville 100 Cigar Humidor also has an engraveable brass nameplate that allows its owners to personalize it. Most of the complaints and negative reviews lobbed at this product have to do with its weight. At six pounds, it certainly is not the lightest humidor on the market. However, considering the humidor is not meant to be carried from one place to another, this piece of criticism should be taken with a grain of salt. At any rate, this humidor features two handles that make it easier to transport whenever it is necessary to do so. An aspect of this product that most expert cigar enthusiasts will surely appreciate is that it includes a high-quality hygrometer. This device is made of glass and features a brass frame. Unlike most hygrometers that are included with a humidor, this is a well-crafted, efficient and accurate device that you will not need to replace unless you feel you need the precision of a digital hygrometer (as some of the most passionate cigar enthusiasts do). While it is not as complex and flamboyant as other such products on the market, the Deauville 100 Cigar Humidor is an efficient, durable and reliable product that will surely increase the lifespan of your cigars. Despite being very straightforward, it is also elegant and expensive looking enough not to be out of place in the most sumptuous cigar room, a fact that is helped by the beautiful tobacco leaf inlay featured on the lid of the box. Holds between 100 and 150 cigars. Gold plated lock and key. It’s not divided into enough compartments. If you have a decent cigar collection, this humidor might be useful since it can hold 25 to 50 cigars. Because it’s a desktop humidor, there’s a clear glass window on the top panel so that you can see your collection without having to open the lid, affecting the humidity levels. For cigars that have different sizes or flavors, the humidor has one internal divider to organize and separate them. The analog hygrometer makes it rather easy to monitor the humidity level without opening the humidor. As for aesthetic, the brass hygrometer ring and gold-plated corner hardware give the humidor a simple yet elegant design. Its premium kiln-dried Spanish cedar lining helps to retain moisture and aroma while also keeping your cigars from getting infested by tobacco beetles. On the front of the humidor is a clasp lock while the interior has a scratch-resistant felt-lined bottom. This is the best humidor under $50! While this humidor isn’t anything fancy, it offers just enough to keep any novice or experienced cigar smoker’s cigar collection fresh and ready to smoke anytime. Its classic look makes it a nice addition to any home office or living room, and you won’t have to worry about breaking the bank. This is a small humidor without any horizontal dividers, so you have to stack your cigars in order to fit them all inside. With this, this humidor may not be ideal if you have a rather large cigar collection and worry about cross flavor contamination. Overall, this desktop humidor is highly ideal for if you’re on a tight budget but don’t want to sacrifice quality. It doesn’t have as many features as more high-end models, but it’s simple enough to use and can keep your cigars fresh and flavorful once properly seasoned and calibrated. Best choice, we recommend! Although simple in its design, the Daniel Marshall Ambiente Humidor has an imposing presence that is difficult to ignore. Often referred to as “the Rolls Royce of humidors”, this is certainly a luxury item that only serious cigar enthusiasts will fully appreciate. The Daniel Marshall Ambiente Humidor’s jet black exterior is highlighted by a gold plated lock and key set that, although minimal, has a way of catching your eye. Meanwhile, internally, it presents a warm natural wood tone that is truly comforting. Lined with Spanish cedar of the highest quality available on the market, the Daniel Marshall Ambiente Humidor is both pleasant to look at and efficient in maintaining humidity. Meticulously handcrafted, the Daniel Marshall Ambiente Humidor features a top level of construction that makes its handling a smooth and delightful experience. Being able to store up to 65 cigars, the humidor is certainly spacious enough for most cigar collectors and enthusiasts. Meanwhile, in order to keep your cigar collection nice and fresh for as long as you need, the Daniel Marshall Ambiente employs a state-of-the-art humidification system (+ humidor hygrometer). In addition to the main humidifying mechanism, the humidifier features self-regulating hydration system that greatly improves its efficiency over extended periods of time. What is more, its Lattice aeration rack can keep everything inside it nice and fresh for months at a time. With everything on the table, it can be firmly stated that the Daniel Marshall Ambiente Humidor is one of the most notable products of its kind. It is made of materials of the highest quality both externally and internally. What is more, its construction is expert, particularly taking into consideration that it’s fully done by hand. Taking all this into consideration, the humidor’s elevated price suddenly seems very reasonable. This notion is confirmed after considering that the Daniel Marshall Ambiente Humidor comes with double divers, a double sized foam pack and a high-quality digital thermometer and hygrometer set attached to the lid. Its glossy finish fades somewhat over time. A notable part of the Diamond Crown St. James Series, the Alexander is a graceful humidor with luxurious features. Covered in an exotic black ebony veneer, this product has a mysterious aura that adds greatly to its style. What is more, this rare wood casing unique black accents that immediately convey a sense of exoticism. As a result, the Alexander is able to ride a fine line between elegance and edginess. This style is further expressed through the humidor’s glossy high glass finish. Even more, this humidor boasts beautiful silver handles and a silver lock and key set. The result is a simple and yet captivating design that would not look out of place in an elegant office or cigar room. In terms of performance, the Alexander features a Diamond Crown proprietary humidification system that uses IMAS technology to regulate itself in order to maintain a consistent level of humidity for prolonged periods of time. Apart from its main humidifying system, the Alexander employs a Lattice aeration rack that guarantees freshness and ventilation at all times. In order to guarantee precision and efficiency, the Alexander also includes a digital hygrometer that was constructed especially to work with its specifications. Being able to hold up to 90 cigars at the same time, this humidor needs very specific humidity settings in order to work optimally. Taking everything into consideration, it can be said that the Alexander is a high-end product that does everything right. Apart from looking fantastically unique despite its minimalist design, this humidor offers the highest quality in humidification technology. Reliable and precise, its humidification system can be trusted to keep your most precious cigar collections in optimal conditions for prolonged periods of time. Meanwhile, its aeration system is capable of reliably maintaining the inside of the humidor fresh, preventing mold, tobacco beetles and other pests from appearing. The Prestige Import Group Chalet Cherry cigar humidor is able to hold anywhere from 25 to 50 cigars. This genuine Spanish cedar-lined humidor is roomy enough for anyone to store their small to medium cigar collection and won’t alter the flavors of the cigars. The rich Cherry finish also makes it a worthy piece to have in your executive office on your desk or on top of the chimney shelf in your living room. … it includes an internal humidifier and hygrometer. The humidifier helps to maintain a constant source of moisture to keep your cigars at an ideal humidity level. Distilled water or humidity packs work best in order to keep your cigars fresh. The hygrometer allows you to easily season and calibrate the humidor to keep a certain level of humidity so your cigars won’t mold or get infested with pesky beetles. Its internal solid brass locking hinges secure your cigars with an airtight seal, and if you wish to divide your cigars by flavor and size, the humidor comes with an internal and adjustable divider. It’s also equipped with a scratch-resistant felt bottom to keep both your cigars and the humidor itself intact for years. If you’re a novice cigar smoker looking for a humidor that does the job without any fancy bells and whistles, then this humidor may be ideal for your collection. It may not have as many beneficial features compared to more expensive humidors, but it can certainly preserve the flavor and shape of your cigars as long as you adjust the humidity correctly. This particular version of the Prestige Import Group Chalet humidor doesn’t have a glass top panel, so it may be a little inconvenient for those who don’t want to affect the humidity levels by opening the lid. There are also no instructions that come with the humidor, so it may be a bit difficult to figure out how to season and calibrate for newbies. Ultimately, this humidor can be of great use to those with a moderate-sized cigar collection without having to go over your budget. It can be used by either new cigar smokers or experienced ones since it’s simple to use and has an attractive and elegant dark cherry exterior. Great for your office desktop or on top of your nightstand, this cherry humidor is able to fit 18-25 cigars horizontally and 50-73 cigars vertically (depending on size). It’s properly lined with Spanish cedar for keeping the flavor of your cigars fresh and it also comes with a humidifier and hygrometer. The hygrometer is set up on the outside and sports a brass ring around it to further enhance the humidor’s classy appearance. A handy instruction manual is included with the humidor to help new cigar smokers calibrate and season it to maintain the ideal level of humidity and to prevent their cigars from molding or turning bitter. If you like to separate your cigars according to their country of origin, flavor, or size, it comes with a cedar divider that’s easily adjustable. The clear top panel allows you to see your cigars without having to open the lid, which can be a big bonus for those that worry about throwing off the humidity levels by opening the humidor too often. Although, it should be known that the clear panel is actually plastic, not glass. This may not be a huge concern to novices but can be a deal breaker for more avid cigar smokers. The Scorch Torch can be a great starter humidor for those that are new to smoking cigars but can’t try out their entire collection all at once. It fits quite a lot of cigars which is good for if you have a rather big assortment, but if you don’t want to risk cross flavor contamination, it may be best to consider a large humidor. While the clear panel is plastic and not glass, the overall build quality and appearance of this humidor is generally praised. The few issues that are commonly mentioned is its inconsistent humidity readings, difficulty in maintaining humidity levels, and constant monitoring. The hygrometer tends to be inaccurate at times but is easily adjustable. Although, it never seems to stay adjusted which means it may need to be checked on every now and then. You can always put a shot glass filled with distilled water inside the humidor to provide enough moisture to keep your cigars from drying out. This simplistic yet elegant humidor is entirely coated with high-quality 100% Spanish cedar wood on the inside and perimeter coaming seal. The Spanish cedar ensures that moisture is maintained within the humidor which extends the life of your cigars and keeps them fresh. For an airtight seal to fully protect your cigars from drying out and getting molded, the fully sealed exterior surface and magnetic enclosure keeps the inside at an ideal humidity level. Typically, this humidity is maintained at a 65-75% threshold for optimal cigar flavor. The humidor additionally comes with a pre-calibrated hygrometer and an ideal sized humidifier to make maintaining moisture easy. You can fit up to 25 cigars in this humidor, making it a decent size for beginner cigar smokers or slightly more experienced smokers. Its size is also small enough so that you can take it anywhere for those special occasions or if you’re planning to give it as a gift. The cherry hues on this humidor change depending on how much light is in the environment, thus it ranges from bright red in direct light to deep red in dimmer light. You won’t have to worry about spending top dollar to get this humidor, and it’s very easy to use for both novices and experienced cigar aficionados alike. The hygrometer is simple to adjust and the overall look is clean and polished so that you can place it anywhere in your home. It’s also packaged rather well so it’ll arrive to you without little to no scratches or chips. The Case Elegance Humidor unfortunately doesn’t have a glass top panel so you’ll have to open the lid in order to view your cigars which has the possibility of affecting the humidity levels. The hygrometer is also said to be a bit off at times, so it’s important to check that you calibrated and seasoned the humidor correctly to prevent your cigars from drying out or suffering a tobacco beetle infestation. Able to hold 15 to 20 cigars vertically (a little more if you have various sizes), this small desktop humidor is lined with genuine Spanish cedar to preserve your small to medium collection so that flavor and quality don’t suffer. 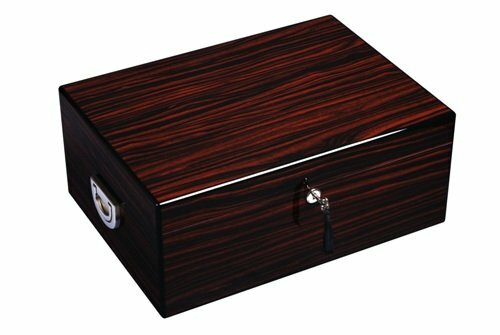 The humidor itself is made of high-quality cedar wood with a dark cherry finish making it attractive enough to place in your home office or living room. The glass top panel lets you see all of your cigars at once without having to open the lid and risk affecting the humidity levels inside. 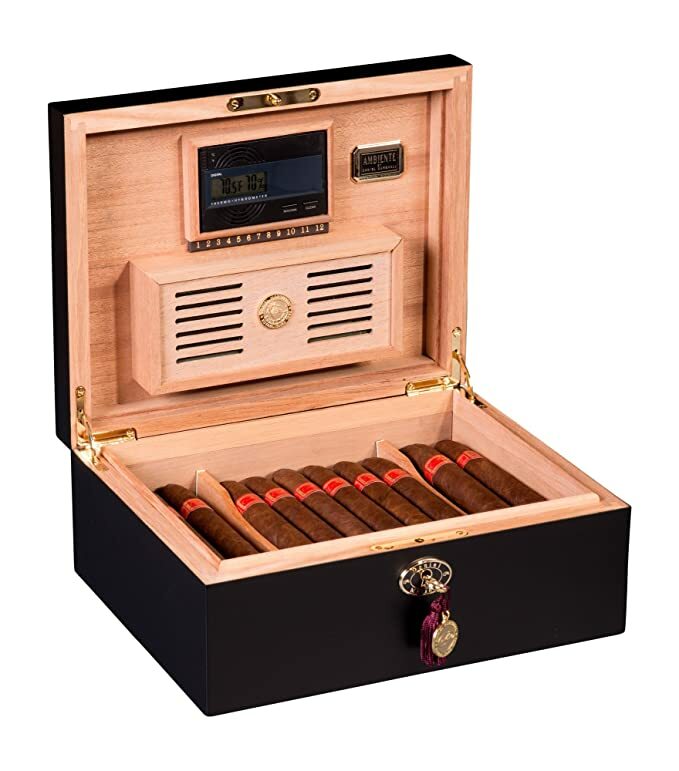 Additionally, the humidor comes with a built-in hygrometer and a humidifier, both of which help to maintain the ideal temperature and moisture level so that your cigars don’t turn bitter, dry out, or burn out mid-smoke. If you like to organize your cigars by tobacco type, flavor, or size, the humidor comes with a removable and adjustable divider. This can come in handy for those who are concerned with cross flavor contamination. The seal on this humidor is soft enough to the point where you don’t have to force it open but also won’t open if tilted upside down. The built-in hygrometer is placed in the front of the humidor so you can easily see the humidity levels and can make any adjustments as you please. Keep in mind that the inside of the box can be a little dry upon arrival, so it’s best to wipe the interior down with a damp cloth or leave a shot glass full of distilled water for a few days before use. Getting this humidor won’t leave your wallet empty and is simple to use among cigar smoking novices and experts. It may not have enough room inside for those with larger collections. Because you have to stack your cigars in order to fit a little less than two dozen, it’s also not recommended if you like to keep different cigars separate to avoid transferring flavors. One divider might not be enough for those who have a large variety they’d like to keep separate. No matter the size of your collection, it’s important to have a cigar humidor to keep your cigars fresh, flavorful, and intact. A humidor is essentially an airtight container that is equipped with a humidifier which keeps the cigars in an ideal climate to prevent them from drying out. Before buying a humidor, there are a few different factors to look out for to make sure your collection is stored properly. Small humidors are most ideal for those who have just started to smoke cigars and don’t have a relatively large assortment yet. Usually, you can fit around 25-50 depending on the size of the cigars themselves and whether or not you’re choosing to stack them. Small humidors can fit right on top of your desk, on your nightstand, that secret compartment in your closet, or on top of your chimney-shelf. They’re also great for if you don’t have that big of a budget. You most likely won’t break the bank buying a small humidor but you also won’t leave out quality if you get one made from the right material. Most nice humidors of this small size typically cost around $25 to $50. Travel humidors are considered small humidors that you can take with you on the road. Some are meant to hold around 10 cigars, but there are some that can hold up to around 40. For maximum protection, they’re built with a hard shell exterior and have a soft foam interior so your cigars stay intact if they roll around inside. Depending on size, these can be anywhere from $20 to $70. Medium humidors hold a lot more than small ones, for while most small humidors have a max capacity of around 50 cigars, medium-sized humidors can fit between 50 and 150 cigars. These usually have a removable tray so that you can stack your cigars and still be able to reach other ones at the bottom. You can probably expect to spend around $60 to $180 on a good quality medium sized humidor. Large humidors aren’t like small or medium humidors since they’re not designed as chests you can easily place on your desk or in your living room. These large humidors can store rather huge collections of 300 to a few thousand cigars. They’re meant to be like another piece of furniture because of their large size, and the great thing about them is you can choose from many styles, shapes, and designs. Those with an expansive collection of cigars most commonly opt for the “tower” style since it’s one of the only large humidors that can hold the biggest amount of cigars. You should be ready to make quite a big investment since these range from anywhere between $200 to $3000. Cigar fridges are a popular way to store cigars and the idea originates from when someone decided to transform a wine fridge into a humidor. Cigar fridges are also known as a cigar cooler or wineador, and they come in many different styles and designs. They typically have built-in fans to help the humidity inside circulate while the fridge itself makes sure the temperature doesn’t exceed a certain level. Cigar fridges are usually smaller in size compared to large humidors, so you’re probably looking at around $200 to $450 for a nicely built one. If you are looking for this one, we strongly recommend to read our review here. When deciding upon a humidor, make sure it has an airtight seal that passes the “dollar bill test,” a Spanish cedar interior, a proper humidifier, and a consistent and accurate hygrometer. Also you should think about space for your best cigar cutter, why not? Does it Have an Airtight Seal? Humidors keep the interior at an ideal climate for your cigars by absorbing and maintain a set humidity level from either a humidifier pack, humidity tubes, or even a shot glass full of distilled water. If your humidor has even the slightest bit of air from the outside, moisture will escape which will result in it having an unstable humidity level. Your cigars will then dry out and they’ll taste bitter when you try to smoke them. There are a couple ways to check if your humidor has an airtight seal. You can try the “dollar bill” test where you place half of a dollar inside the humidor, close the lid, and see if the humidor pulls along when you pull the dollar. If you can pull the dollar through without the humidor following, then it doesn’t have an airtight seal. You can also place a small flashlight inside the humidor, close the lid, and then check if any light is escaping. If you can see obvious cracks of light between the lid and the body, then the seal isn’t airtight. Does it Have a Spanish Cedar Interior? A lot of the highest-quality humidors are made with a Spanish cedar interior. This type of wood is the most recommended and sought for because of its great ability to absorb and retain moisture. It’s also highly effective in preventing tobacco beetles from infesting your cigars and multiplying inside your humidor. For travel humidors, look for ones that have at least a partial Spanish cedar lining since it’s a lot more effective at retaining moisture, especially if you’re going to be traveling to different places with different climates. Almost all humidors have a hygrometer which measures and displays the humidity level inside. These are used when you’re “seasoning” your humidor to a specific humidity level (which is usually 65-73%) and need to watch that it maintains that level. Some are pre-calibrated while some need to be manually set up, but it’s always safe to calibrate your humidor yourself. Humidors need to have a humidifier inside in order to have a source of moisture to keep your cigars from drying out and turning bitter and unpleasant. Some humidors have pre-installed humidifiers but some don’t come with any source of moisture at all. Humidors are designed to maintain the humidity for storing your cigars to imitate the climate where the tobacco originates from. But we strongly recommend you to buy the humidifier and Boveda Packs. Humidifiers need to be resupplied over time, so it’s best to keep track of how fast the humidifier runs out of moisture and to have a sufficient supply of humidity packs or distilled water at the ready. Few things go together better than a good cigar and a nice glass of wine. Amazingly, some manufacturers have had the great idea of combining a wine cooler and a cigar humidor in one single, convenient product. Combination cigar and wine coolers are perfect for man caves, wine bars and more. Using separate compartments, they can keep your wine at the perfect temperature while maintaining your cigars nice and moist. Typically, these products feature adjustable thermostats with temperature range for both the cooler and the humidor zones. At the same time, they may feature useful accessories such as a humidity tray and a hygrometer. Typically, right after manufacturing, cigars have a moisture level that is between 14 and 17 percent. In order to keep them in the best condition possible, you need to maintain this level of humidity in your cigars until it is time to smoke them. There are various tips for achieving this. However, there is an easy way to ensure that your humidor has the right amount of humidity and temperature. The rule of thumb for keeping your cigars in optimal condition is known as the 70/70 rule. Simply put, the rule goes that you should keep your humidor at 70 degrees Fahrenheit and 70 percent relative humidity. By keeping these conditions in a stable and continual fashion, you will extend the lifespan of your cigars while maintaining their aroma and flavor. As a result, even if you keep your cigars stored for long periods of time, you can stop worrying about problems such as mold and insect damage. Additionally, following this rule will greatly increase the lifespan of your cigar collection. As previously mentioned, a good humidor should be able to maintain the temperature at around 70 degrees Fahrenheit. At the same time, it should keep its internal humidity at around 70 percent relative humidity. However, there are other criteria that a humidor needs to meet in order to be considered a high-quality product. An adequate humidification system: Because their main purpose is to maintain cigars humid, humidors rely very heavily on a humidification system. To that end, active electronic humidification systems are the most efficient. However, there are passive humidifiers that do the job well, particularly those that are polymer based. At any rate, try to avoid sponge based humidification systems as they are the least efficient. A high-quality interior lining: Without a doubt, Spanish cedar is the best material to make a humidor’s interior lining. The reason for this is that the material absorbs humidity and maintains temperature for prolonged periods of time. Apart from its quality, the thickness of the Spanish cedar wood is critical. Anything between 3 and 5 millimeters will do the job just fine. An efficient air circulation system: In order to prevent problems such as mold, it is important that a humidor has an efficient air circulation system. Both the construction of the humidor and the design of its tray should allow free air circulation everywhere in the humidor. It should be noted, however, that a correct air circulation does not depend exclusively on the construction of the humidor. The room you place it in needs to be fresh and well-ventilated as well. A solid construction: Of course, the humidor’s construction should be solid and durable, preventing it from falling apart. A well-constructed humidor should last what is essentially a lifetime. Hinges constitute an important(and often overlooked) part of the construction. Make sure that they are low-friction and made of high-quality metal. Additionally, look for quadrant hinges as this is the most durable and efficient kind. An accurate hygrometer: A hygrometer is an important tool that is capable of measuring the humidity in the air or a gas. As such, it can help you monitor the right level of humidity in your humidor at all times. If possible, go for a hygrometer that uses a hair mechanism instead of a metal spring mechanism. Apart from being more precise, hygrometers that use a hair mechanism are more durable than their metal spring mechanism counterpart. A strong humidor corpus: Make sure to look at the strength of a humidor’s wooden corpus before buying it. Because it improves the isolation of the humidor, a strong corpus is an important part of the device. Remember that the best wood for the humidor is Spanish cedar. A high-quality finish: Finally, a good humidor should have quality lacquer and a refined finish. While this will not affect the functioning of the humidor, it will make it more visually-pleasant and elegant. Theoretically, under the right conditions, cigars can be kept in a humidor for an unlimited period of time. As a matter of fact, aged high-quality premium cigars are cherished due to the special flavor they develop after several years in storage. For this to work, however, the humidor that the cigars are stored in has to be set at a constant relative humidity of around 70 percent. Additionally, the humidor should have an adequate and efficient air circulation system. Simply put, mold is a type of fungus that grows as thread-like multicellular structures. Almost inevitably, mold forms in spots where heat, moisture and organic material combine. Considering how destructive mold can be, this is not a good thing at all. Sadly, the three conditions for the growth of mold exist in a cigar humidor. As a matter of fact, heat and moisture are essential for maintaining the organic material that cigars are made of. However, if you go even a little bit overboard with heat and humidity, mold may form. On the other hand, if you don’t provide enough moisture and heat, your cigars may dry out and become stale. Luckily, there are a few steps you can take in order to prevent the formation of mold in your humidor. Before taking action, it’s important to know that mold spores are everywhere around us. However, they are perfectly harmless as long as the right conditions for their development are not met. As previously mentioned, these conditions involve plenty of heat, a lot of humidity and a good amount of organic material. To avoid this from happening, you can limit the heat of your humidor to 72 degrees Fahrenheit. Meanwhile, the humidity should be at a maximum of 72 percent. Another efficient way to prevent mold from forming in your humidor is (simply) checking. Mold grows slowly, giving you plenty of time to notice it and remove it before it has the opportunity to cause damage. In this type of situation, your sense of smell can come in very handy. If mold is beginning to form, before you see anything, you will likely notice a pungent, musty smell. This is a clear indication that you need to clean the humidor and get rid of the mold spores before it’s too late. First off, empty the humidor. Using a small brush, remove all traces of mold off your cigars before placing them in a dry environment. Next, use the brush to carefully clean the humidor’s surfaces. Once that is done, you need to kill the mold spores by using a solution of distilled water and isopropyl (rubbing alcohol). Wipe down the humidor’s external and internal surfaces. After you have done that, leave it out to dry without closing it. Even more damaging to your cigars than mold is the tobacco beetle. Terrifyingly, an infestation of these bugs can turn your beloved collection to shreds in a matter of days. As harmful as they are, though, tobacco beetles can be prevented and, given the case, eliminated. Tobacco beetles are born in your humidor from eggs that are hidden in new cigars. Sadly, even the best cigar manufacturers can’t prevent this from happening from time to time. Luckily, only a few beetle eggs are likely to be hidden in a contaminated cigar. Consequently, checking your collection periodically can help you catch the first few, preventing them from reproducing and forming an infestation. By checking your humidor every once in a while, you can ensure that your collection will be safe. At this point, you might be wondering how to tell if these pests have already started to break out in your collection of cigars. Outside of actually dismantling one of your cigars to see whether you find the insects inside it, the best thing you can do is check for tobacco dust that should not be there. If, unfortunately, your humidor has already been compromised, there are a few things you can do. However, by far, the most effective solution is to freeze the tobacco beetles. In order to do freeze tobacco beetles out of your humidor and cigar collection, go through the following steps. First, remove all the cigars from the humidor. Next, place them inside Ziploc bags. If you want to avoid freezer burn, you may double bag them. In continuation, seal the bags very tightly. Once you have done that, put the Ziplog gas in the fridge for 24 hours straight. After that, it is time to transfer the bags to the freezer. Even if it may seem like much, leave the bags in the freezer for three whole days. After going through all the previously mentioned steps, transfer the bags back to the fridge, leaving them for 24 hours. This is an important step because it eases the transition for the cigars, preventing them from cracking. Finally, you are ready to place the cigar back in the humidor. The steps you need to take in the case that the humidity in your humidor is too low are the following. First, ensure that the hygrometer has been correctly calibrated. The best way to calibrate a hygrometer is using the salt solution method. Additionally, ensure that it has been filled with the appropriate propylene glycol solution. Finally, make sure that the interior of the humidor has been sufficiently moistened at first use. When measuring the results, take into account that a decrease in the humidity of the humidor after putting dry cigars inside it is perfectly normal. Typically, a humidor should not exceed 75% in humidity. If yours does, you need to take a few measures. First, open the humidor and leave it open for a few hours. After you do this, the humidity level will have fallen. Measure the humidity and, if necessary, repeat the process a few times in the following days. If this does not work, check the humidor’s humidification system. Perhaps it requires less water in order to function properly. Alternatively, you can replace the humidifier with a smaller model. Being made of Spanish cedar wood, over time, a humidor can form resin in its surface. In particular, this occurs when the wood has not been thoroughly dried before the manufacturing process of the humidor begins. This resin is stick and smelly, and it can only be removed using certain substances and tools. While this resin does not directly affect the quality of the cigars, it can stain their exterior and hinder the smoking experience. Initially, take the cigars out of the humidor. Next, clean the resin using acetone. After that, the spots where the resin formed need to be treated with a piece of fine-grained sandpaper. This process should be repeated two or three times, especially if the lining is made of thick cedar. Once that has been accomplished, open the humidor and leave it to ventilate for a few hours. Finally, put the cigars back in the humidor. Dry cigars can be revived as long as their wrapper has not cracked. Before attempting to do this, be aware that the process is not an immediate one. As a matter of fact, the process can take weeks and even months. To revive a cigar, you will need to use a humidor. After emptying its contents, use a piece of cloth that is moist to wipe its walls, making sure every inch is covered. Apart from helping you revive your cigars, this will prevent the proliferation of mold or bugs. Next, refill the humidor’s humidifier using distilled water. At this point, you are ready to put the dry cigars in the humidor. Sometimes, your humidor can catch a smell, particularly when you store cigars with a strong scent for an extended period of time. As a first effort, you may attempt to air it out by leaving it open for a few days. Sometimes, this does the trick just fine. However, it may not work on the first try. At this point, if you see a light at the end of the tunnel, you may try leaving it out for a few more days. If this does not work, wipe down the inside of the humidor using isopropyl alcohol or denatured alcohol. Try to use as little as possible, however, as these substances are strong and can damage the wood if used excessively. Leave the humidor to dry for a few hours. In the case that this does not work either, you can use baking soda. Simply fill the humidor with it, close it and leave it be for about a week. After that, empty the humidor and wipe it down in order to clean it. Hopefully, one of the previously described steps will help remove the annoying smell from your humidor. However, if it does not, there is one last option: A glass of brandy or whiskey. Simply rub the liquid on the interior walls of the humidor, making sure they get nice and moist. The only drawback of this technique is that your humidor will then have the smell of the alcoholic beverage for some time. However, this is not a big problem as many people actually enjoy it. As a matter of fact, some people put a few drops of whiskey or brandy in their humidor’s humidification system in order to get that scent. When you try this technique, remember to keep the humidor closed for a few hours. Each of the humidors we’ve listed and reviewed above can be of good use whether you have a small or medium cigar collection. They all have a Spanish cedar interior, a hygrometer, and an attractive exterior design. Some of them have glass top panels for convenience along with interior dividers for further organization. No matter which you choose, they’re all ideal for the novice or expert cigar smoker who doesn’t want to spend their entire paycheck but is still looking for quality and efficiency.